Self-awareness can be hard to pin down. The very term “self-awareness” sounds a little bit intense and mysterious. As the great philosopher Socrates said, “Know Thyself.” It can seem like self-awareness is a long deep journey and the key to everything. That may very well be the case, but how does one apply it practically? It can help a great deal to take an action or purpose-based approach to the question. In other words, what are we trying to accomplish with self-awareness? In coaching, we are trying to be sufficiently aware of our own mental state and condition to make sure these don’t get in the way of us being able to be there and observe clearly, and so assist our team or the other person we’re helping. Self-awareness then is connected to both self-management and presence. Using the same action-based perspective, we can come up with some useful definitions for these as well. Presence, we could say, is being there, which includes extroversion and interest. That’s the goal. Presence enables judgment and proper action. Self-management would simply be doing what’s needed to address a departure from presence that is identified through self-awareness. “No reacting” is a very limited view of self-awareness and self-management. Focusing on what we perceive as our flaws, or some attitude, in order to control them can, if carried to far, be introverting and produce the opposite result we’re trying to achieve. We get so caught up in watching for and holding back certain behaviors that we cease to be present. The frustration builds and you end up either exhausted or erupting, much to your regret. That doesn’t mean you shouldn’t self-manage. What it suggests is that if you self-manage toward presence, not just away from what you’re trying to avoid (and so inevitably pulling in on yourself it seems), you will have more success. When you focus on being more present, you shift your attention to your environment, to your level of interest and how to improve it. Your attention is on the goal, not the barriers. Self-awareness helps in spotting those barriers, and being aware of some that might arise, and getting them out of the way of the real purpose. So the self-awareness we’re talking about is not a “vision quest.” It’s a tool to improve presence through self-management. Think of a time you facilitated a great meeting or participated actively in one, or had a great discussion. How much of your attention was on yourself? In most cases probably not a lot. Your attention was on the topic, the people. You were interested. At the same time, your self-awareness was probably quite high! But it was positively directed, and you were not caught up in mechanics. You perceived clearly your relative position in the group and embraced the dynamics of the situation. Self-awareness, self-management and presence are interdependent. The more you do or have of one, the more the other two are enhanced as well. It can be counter-intuitive until you look at it. For example, if you just made the decision, “I’m going to improve my self-management,” You would see, just by acting on that decision, that your self-awareness comes up. Similarly, the more present you are in any environment or situation, the more your self-awareness is enhanced. 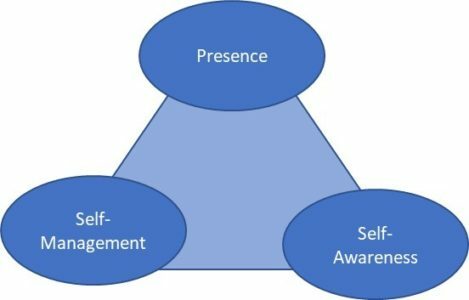 Think of self-awareness, self-management and presence as three corners of a triangle. Expand one, and the other two corners expand. And the reverse is also true. If you are not at all present to begin with, your self-awareness is inevitably reduced. If you take no responsibility for self-management you will, inevitably become less aware and less present. This opens the door to a number of simple exercises you can do to improve across these three areas. For example, if you just got actively interested in the room, in a person, not only is your presence going to increase, but so is your awareness of yourself relative to this person. Try it sometime. At least in terms of coaching – and probably more broadly – if we take an action or purpose-based approach to self-awareness, it becomes suddenly demystified. And when we view it holistically, together with presence and self-management, we have a practical framework for better, and more satisfying, coaching.